Exit Grabber - Grab your visitors back before they leave your website! Get Resale Rights To Exit Grabber, And You Can Sell It And Keep 100% Of The Profits! When I told my fellow business partners that I was going to offer resale rights for Exit Grabber, they told me I was an idiot. So many people want Exit Grabber, they argued, that I'll make the most money if everyone has to come to me to buy it. They may be correct, but believe it or not I'm not in this to make as much money as possible. I also want to get as much exposure for my product, and so that's why I'm selling the resale rights to Exit Grabber at such a low price. See, typically if a company like mine spends so much time and energy developing a profit-pulling technology like Exit Grabber, they can then sell the resale rights for upwards of $10,000, to a select few clients. But, because I want as many people as possible to be out there selling Exit Grabber, so that my company will become more popular, I'm selling them for, well, let's just say much cheaper than that! But this just isn't any ordinary resale rights package, either. Our marketing team has spent a long time tweaking and tuning our sales process to make it pull sales like crazy. When you purchase this package, you not only get the rights to re-sell Exit Grabber at whatever price you want and keep all the profits, but you also get the complete rights to use our ultra-powerful sales system. This includes the graphics and sales letter on this site. So, all you have to do is plug it into your website and start making money! Unlike a lot of the junk out there, our graphics and sales letter are proven to pull sales. But that isn't even where most of the power is. We actually let you re-brand Exit Grabber with your own affiliate ID. Then, when your customers buy Exit Grabber from you, our systems will automatically follow up with them, and send them tips and tricks for using Exit Grabber. During this proven follow-up system, we will offer them the opportunity to buy the resale rights to Exit Grabber. And if any of them buy, you will make a 50% commission! So, the money doesn't stop right when you sell Exit Grabber. Our follow-up system will keep on selling and guarantee that you will continue to make money for a long time to come. If you've ever wanted your own digital product, that you could call your own, this is your chance. I'm sure you've noticed by now that the people out there making all the real money on the 'net are the ones who own their own product. Well, now you can piggyback off of all my research and development, and get the rights to re-sell my product, along with the marketing maretials that i've created for it! Complete Rights To Re-Sell Exit Grabber And Keep 100% Of The Profits - When you purchase resale rights, you have the complete rights to re-sell Exit Grabber and keep all of the money you make. You can sell Exit Grabber for any price you want as long as it is over $39.95 (this is to protect the value of the software). The Exit-Grabber Sales Kit - Which includes this website, the graphics, and the professionally written sales letter you just read. All you have to do is upload it to your website and it will do the selling for you! You already know it works (you clicked "order," didn't you?). You have the complete right to use the graphics and the sales letter any way you like. Your Own Alternate Graphics - Most resale rights packages don't offer this, but I felt I really should. We paid a designer to create an alternate graphics set (completely different, yet just as good as the ones you're looking at now). This way, when you resell Exit Grabber you can make your page look unique, and not just like a copy of ours. Of course, you can use the standard graphics from this site too, if you want. Rights To A Program With Real Value - This isn't just some program which everyone is giving away for free on their website. Since I require that nobody sells Exit Grabber for less than $39.95, you are guaranteed to have the rights to a valuable product for a long time to come. 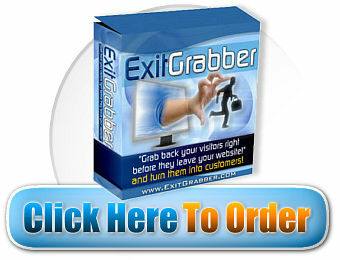 Quick and Instant Profits - You can start re-selling Exit Grabber immediately. Everything you need to re-sell it and keep 100% of the profits will be included when you download in just a minute. Just think, if you sell only five copies per day at the minimum price possible, you'll make $72,908.75 per year! Recurring Profit Streams - We've written a very powerful sequence of emails you can send to the people who buy Exit Grabber from you, which are proven to make additional sales. We've been using these emails to make a lot of money ourselves. You'll be able to "brand" your version of Exit Grabber with your affiliate ID, which will insert your affiliate ID into these emails, so that the money doesn't only come from just selling Exit Grabber. Our emails will make residual profits for you for a long time to come! Free Unlimited Updates - Every time we upgrade Exit Grabber, you will be granted resale rights to the new version. Additionally, your customers will be notified of the new version and they can download it too. This means that you don't have to worry about a thing on the software development side of things. Whether its fixing bugs or adding new features, we'll provide them to your customers directly so you don't have to think about it! A Crazy Money-Back Guarantee - We're so confident in our resale rights, that we're offering a previously unheard of guarantee. For up to 60 days after you purchase our resale rights, you can actually go out and sell Exit Grabber, and keep 100% of the profits. If you aren't satisfied, you can ask for a full refund for the resale rights, but you get to keep the profits from your sales! The only reason I know I can offer this is I know that once you start making sales for Exit Grabber, you won't want a refund! Of course, you can get a refund if you don't make any sales, too. I won't ask any questions, we'll just give you your money back. So how much am I offering the resale rights for? As I already mentioned, typically the rights to a program like this can be found for $10,000 or more. But, because I'm looking to increase exposure for myself, the complete resale rights can be obtained for only $297 $197. Important Note: We are currently testing the price $197 as compared to $297, to see which sells more copies so that I can get the most exposure out of this. We plan to remove this test from our site on 09 21, 2019. And as I said above, I'm offering a 60-day no-questions-asked money-back guarantee on these resale rights. This means you can buy the resale rights and then sell copies of Exit Grabber, keep 100% of the profits, and then ask for a refund later and get your full money back. I know it sounds silly for me to offer something like that, but I'm doing it because I know that I'll get the most exposure out of this if I make this risk-free for you. This way, you don't have to decide now if this is really right for you. You can actually buy my package, see what's inside it, and try selling it for two full months. I know you'll be satisfied, but if you aren't you can get a full refund. Just think -- if you only sell 10 copies of Exit Grabber at $50 each, you'll make $500, which puts you well in the green. If you've been wishing you had your own digital product to sell online to make money, this is your chance. I may not be offering resale rights for much longer, since my business partners still think I'm crazy for doing it. P.S. There's a hidden bonus in our resale rights package worth over $400. I've kept it hidden so that only the people really worthy of finding it can have access to it. Can you find it?